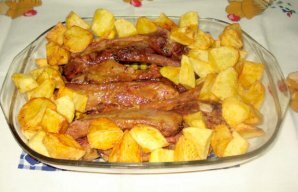 This Portuguese peasant style ribs recipe (receita de entrecosto camponês) is delicious and great comfort food. In a pot, place the olive oil, onion and chopped garlic, the chopped parsley and the bay leaf and cook until the onion begins to look slightly translucent. Add the already peeled and chopped tomatoes and stir occasionally until the tomatoes are sauted. Add the ribs, the chouriço, the piri-piri sauce, the paprika, salt, white wine, carrots and a little water and let it cook for a while (if it starts getting dry, add more water). 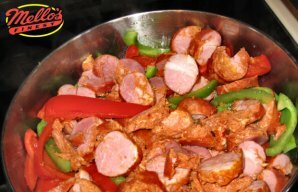 When the meat is almost cooked, add the potatoes and more water if necessary. Let everything cook for another 10 minutes and finally add the chickpeas. Let it finish cooking and serve immediately. These flavorful Portuguese spare ribs with red wine (entrecosto com vinho tinto) make a delicious weeknight dinner, serve with baked potatoes. 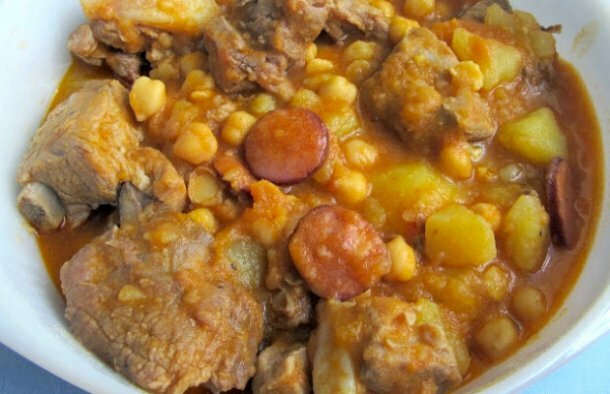 This Portuguese chouriço and peppers recipe in a crockpot or a dutch oven, the longer it cooks the better. 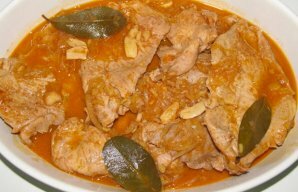 Serve these amazing Portuguese pork steaks (bifanas) on a bun or on a plate accompanied by a good salad and white rice.